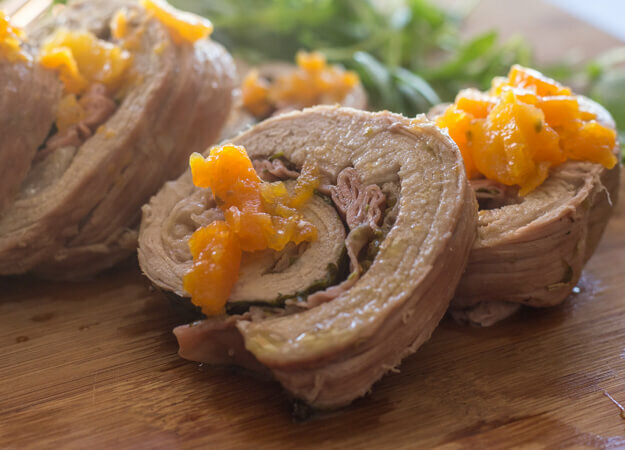 Rollè Italian Stuffed Flank Steak, the perfect family or company dinner Meal. An easy baked meat dish, stuffed with rocket/arugula and mortadella or prosciutto. Delicious. I think for most cultures Sundays are the “Big” dinner day, a Roast and an Amazing Dessert. Well in Italy, it is no different. 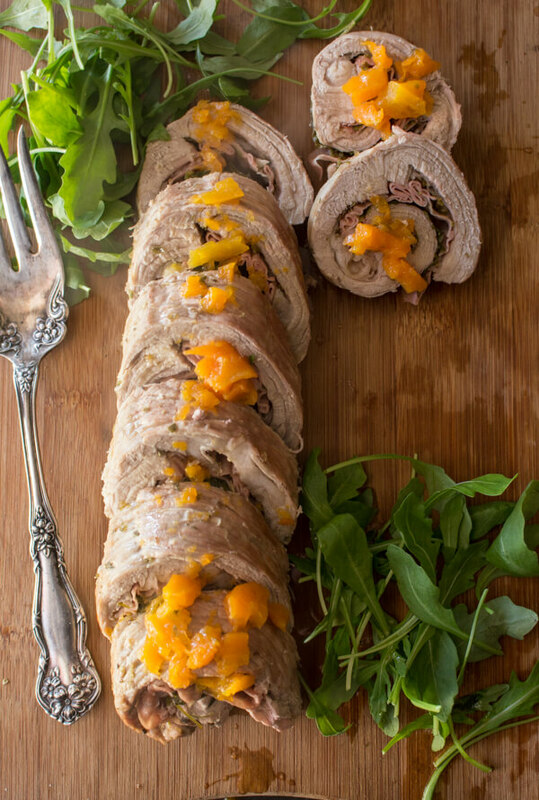 Here a stuffed flank or better known as a Rollè are more popular than a Roast. These amazing creations are usually stuffed with mortadella or Prosciutto di Parma. I have had and made both and they are equally delicious. The easy part with the Prosciutto is you don’t have to remember to salt the meat, because the prosciutto is salty all on it’s own. But this Sunday I decided to go the Mortadella route. 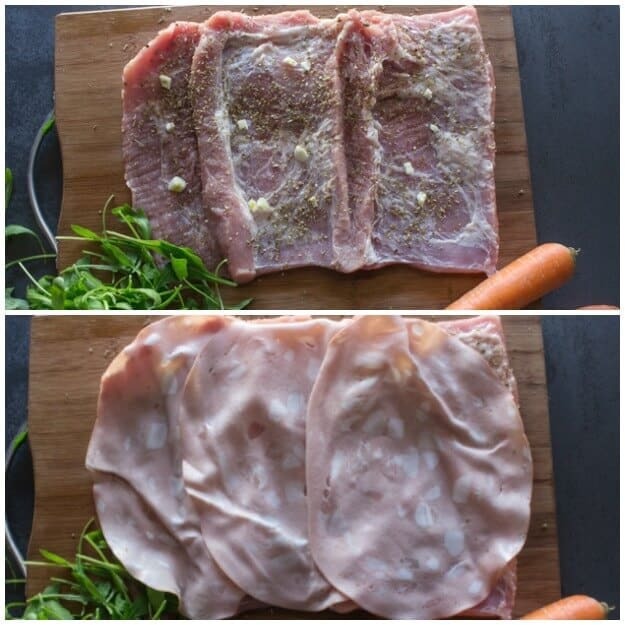 I love the taste of Mortadella and Arugula together add a few spices, a splash of white wine while browning the meat, some carrots while cooking and you have a delicious meat dish that I am sure your family will love. Stuffed Flank Steak or Rollè is one of those dishes that I do rarely but when I do there never seems to be any leftovers. Cooked on a low heat it is never tough, but tender and tasty. 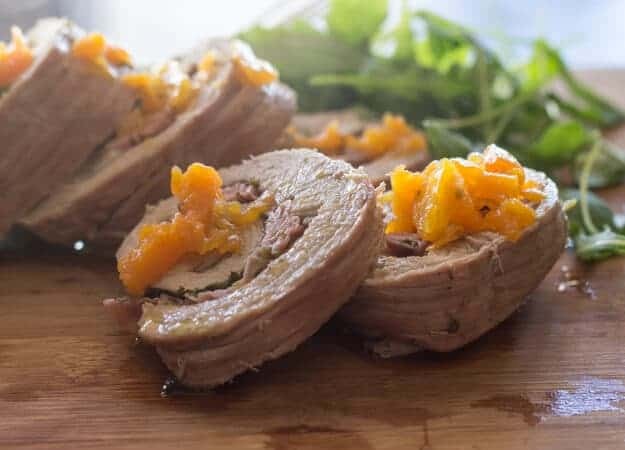 You could always serve this Rollè Italians Stuffed Flank Steak with a simple tossed salad or some delicious Simple Italian Green Beans and how about a side dish of Roasted Potatoes with Rosemary? Here in Italy a stuffed Turkey is not the norm, so I will probably be serving a Stuffed Flank Steak, maybe this time I will use the slices of Prosciutto instead! Buon Appetito! 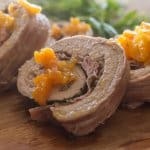 Rollè Italian Stuffed Flank Steak, the perfect family dinner meal recipe, an easy baked stuffed meat dish. Delicious Italian. On a cutting board, layer flank steak with chopped garlic, 1 - 1 1/2 teaspoons of oregano, 7 slices of mortadella (if using prosciutto I removed the excess fat around the slices) cover as best as possible with prosciutto and top with chopped rucola, roll up tightly and tie with string. 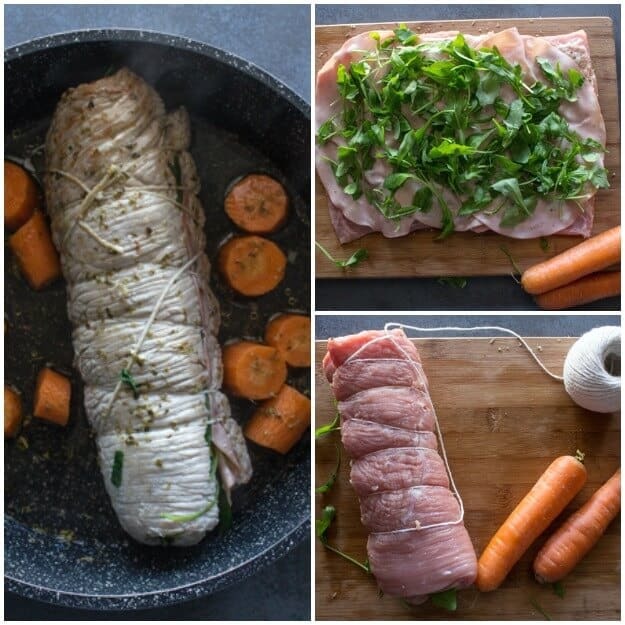 Add 2 tablespoons of olive oil to a medium sized baking pan (with lid), place the rolled up flank steak in the pan and brown on both sides on medium high heat, add the wine and heat until evaporated then add the chopped carrots, sprinkle with 1 teaspoon of oregano and 1/4 teaspoon of salt. I really like oregano so I sprinkled a little extra on the meat and a pinch of salt also. Add the water, cover and heat on medium till boiling, then lower heat and continue to cook for 30-35 minutes, remove flank steak from pan, and let cool for 10-15 minutes, while flank is cooling, mash carrots in pan and continue to heat (raising the heat) till some of the water evaporates (if most of the water has evaporated, then skip this part) remove string and cut flank into slices , add slices to pan and heat through, serve immediately. Hi Heather, thanks if you make it let me know how you enjoyed it. Have a great day.